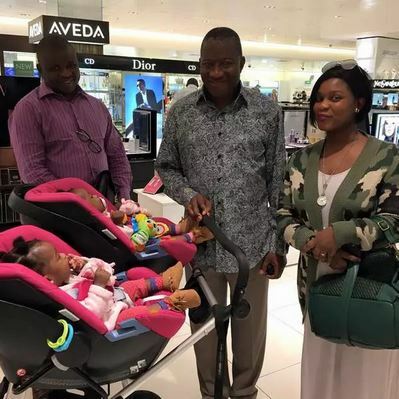 It has been learned that Goodluck Jonathan, Nigeria’s immediate past president, was (is) in London. The former leader of the country was spotted apparently at the United Kingdom’s Heathrow Airport yesterday. The photo which appeared on @SituationRoomNg account went viral. Based on the outfit, it could be alleged that Jonathan is currently on vacation. Meanwhile the new president yesterday arrived in Germany for the G7 Summit. Last week Muhammadu Buhari visited Niger and Chad to hold discussions regarding the fight against the Boko Haram insurgency. Goodman,Good luck,Good looking,I love u sir. You,ll continue to abide under God,s shadow. Your enemies shall not even see your back. Under God,s wings you shall fly!!! Guy (or girl), don’t you read the news? Can’t believe you’d call a man god-fearing after robbing this country blind! You wouldn’t know those virtues even if it hit you in the face! Suit yourself! Elections are over and what we are faced with now is way forward as to how to make our nation better and greater. Please stop the insults and name calling of GEJ. He looks happier than ever. His smile is genuine unlike all those his forced smiles while he was in office… With the trouble of Nigeria off his shoulders y won’t he b happy nd cheerful. Enjoy ur vacation sir… Someone said he doesn’t look like an ex president nd am wondering if there’s a particular way an ex president is supposed to look like.. Humans!!!!!!! Yes he doesn’t Look a bit like an ex-president,no usual crowd unlike d ones dat trail wit OBJ…he’s simple,calm,casual but most importantlly,he’s more handsome. Its good 2 relax after leading a country like nigeria. Er…correction: Jonathan DID NOT have a good understanding of how to lead Nigeria. Chibok girls, mismanagement of petrol funds, sacking of a CBN governor without due process, removal of subsidy on January 1 that stranded half of the country that traveled for Christmas, giving MEND and OPC petrol asset protection contracts that could be handled for free by our military…that’s from the top of my head. Unless he gave you money for campaign, what has he done for you? Oh, one more thing: He wasn’t voted in because of his prowess in leadership. If I remember correctly, we voted him in because we thought he will bring good luck! Said that just in case you’d think a reason why he was a good leader was because he got elected. Well at least he looks sober. He looks cool and relax. I think he has a relaxed mind now.. 7F188C0D. Well earned rest .Critics may blabber on. A man of peace kindness n fear of the unknown! We stil love honorable Azikiwe Godluck Jonathan. May God uplit u to greatest height. Let forget about jonathan let move forward ,we are after future thanks.